We offer a range of Private lessons at all levels with our resident Instructor Jennie Cootes. Jen has grown up around horses, competing at pony and riding club level since the age of 10. 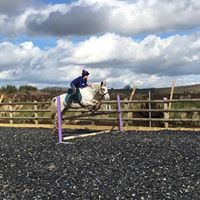 Beginning her training life with 3 years at the Talland School of Equitation in Gloucestershire, Paul’s daughter has spent the past 7 years training and competing at some of the best yards in England. She has evented in the USA and experienced training in Spain, expanding her equine knowledge and experience in various areas of the equine world. She now manages the Yard at Hallagenna alongside her Team of Riding Escorts and Assistants. They all love sharing the experience of our horses and fantastic moorland riding with our visitors and guests. 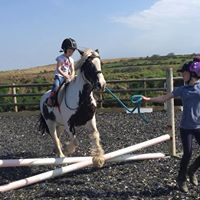 She aims to achieve an excellent rapport with all our riders, as she conveys her knowledge to build confidence with each lesson. Her other passion lies in competing and she especially enjoys training young horses for competition. We also run competition shows at Hallagenna for regular riders – a great way to obtain show experience and gain confidence. N.B. : Please arrive at the stables about 15 minutes before your ride.